Grab your friends and join a class! As seen on Shark Tank! Spring, Easter and Mother's Day workshops are now live! 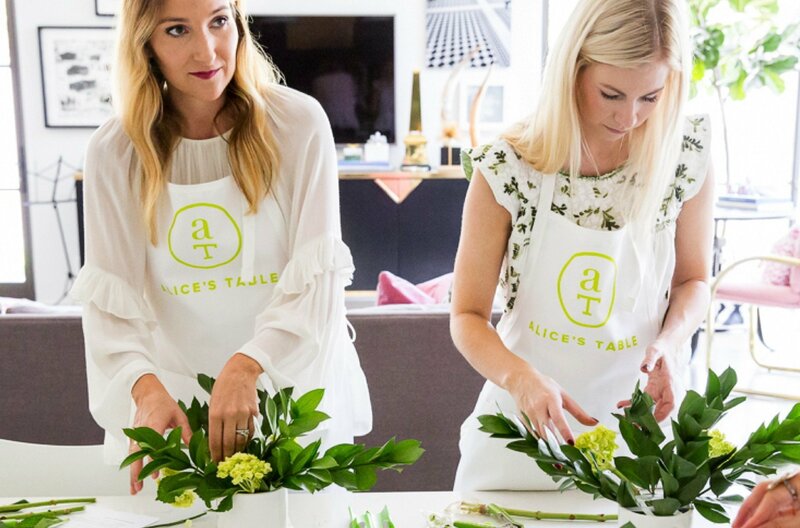 Alice's Table brings women together to learn new skills, and live a social and creative lifestyle. Our goal is to be the bright spot in the modern busy woman’s life - the thing she looks forward to at home and on the town. Modern women don’t have time to be Martha, they need lifestyle delivered. Become a successful female entrepreneur on your schedule. We provide you with an Alice’s Table starter kit that comes with everything you will need to launch your business. It’s fun, flexible, and rewarding… hello, dream job! Join us in your local city to learn the art of flower arranging, sip cocktails, and bring home beautiful fresh-cut flowers to enjoy. Be the talk of the town! Want to learn something new and feel festive all day long at Nantucket's Daffodil Festival? These spring flower crowns are sure to make you feel fabulous! Guests will also enjoy sweet treats and exclusive store specials & free gifts offered by Southern Tide! Brunch + blooms! Grab your gals for a fun Saturday at Capo. Craft a unique floral wreath that will add some Spring to your home. Ticket price includes one drink. Cheers to a full glass and rising temperatures! Magnolias and Mimosas…a flower arranging class celebrating the “Mums”. Join us for a complimentary mimosa while we learn to create a gorgeous spring floral arrangement using fresh seasonal blooms. Follow us for the latest events, arrangements, cocktail pairings and more.